We know, “improving” s’mores sounds like heresy. What could be more perfect than crunchy graham cracker, golden-toasted marshmallow, and gooey chocolate? These chefs have a few ideas. I’m a sucker for the classic combo, but sometimes I mix it up and use Peeps for my marshmallow. We also like to do a rich chocolate pudding topped with toasted marshmallow fluff and homemade graham crackers to scoop it all up. Pro tip 1: When you toast the marshmallows, use the heat from the coals and not the flames. The coals are hotter and provide a more consistent and even toast on the marshmallow. Pro tip 2: Build the chocolate and graham cracker prior to roasting, and place it near the fire so that the chocolate softens, but doesn’t melt it fully. One word: bacon. Whenever I go camping I always make bacon—actually who am I fooling, I make bacon just about every day as I’m the chef-owner of a breakfast joint—and I make sure to stash some for the campfire to add to my s’mores. Bacon goes with just about everything, but the salty addition to marshmallows, chocolate, and cinnamon graham crackers is to die for. Maple bacon or applewood smoked work best with the dessert but no variety will disappoint. We make a s’more parfait at the restaurant that’s a dark chocolate pot de crème layered with graham crumbs and topped with toasted marshmallow served in a mason jar. You can create the s’mores as a parfait like we do at The Dinky, layering similar flavors in the mason jar. Another way to do it would be to make a fluffy meringue as we do for the top of the parfait instead of a traditional marshmallow. This allows you to toast the meringue ahead of time with a blow torch, and it stays creamy and fluffy, where as a traditional marshmallow can be dense and needs to be toasted right before serving. The meringue still mimicks the flavor of toasted marshmallow. Make PB&J s’mores! Combine classic s’mores with layers of peanut butter and jelly to give it a familiar and satisfying taste. S’mores are one of my favorite mediums in which to use all those expensive chocolate bars I impulse buy at the fancy-grocery-store checkout: hibiscus flower, espresso, ginger, toffee, ash-and-goat-milk-and-elf-tears. Melt a bunch of those on graham crackers and set yourself out a little s’mores buffet. S’mores are one of those things like peanut butter and jelly or french fries and ketchup where the combination is absolutely perfect. 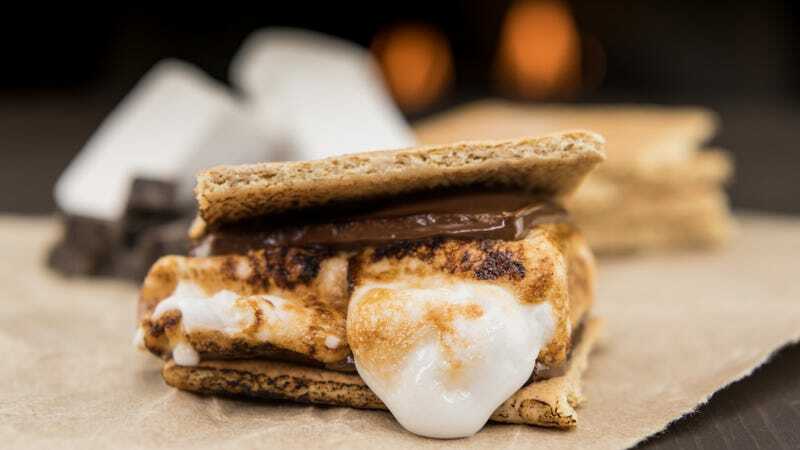 So usually, I’m a straight-up purist: two squares Hershey’s bar, graham cracker, plain old marshmallow, campfire (although have been known to substitute a microwave in desperate times). The only time I’ll change it is to add a flavor to one of those three ingredients: Maybe a fancy cinnamon graham cracker, or gourmet vanilla or strawberry marshmallow. Sorry Kate, my Hershey’s always stays the same: Some things are classic for a reason. I love Whoppers/Maltesers. I love chocolate malts. So the moment I connected malted milk powder and S’mores, I knew I had a winner even before I tasted it. And sure enough, a spoonful over the marshmallows gives it that diner flavor (the powder doesn’t really adhere until the marshmallow melts, but it’s a sacrifice you must endure).